Who Is Your Toughest Leadership Challenge? Who Is Your Toughest Leadership Challenge examines The Art of Self-Leadership. The most overlooked area of leadership is this area of self-leadership. After all, the toughest management challenge is always yourself. When you mention the word leadership, most people reference those who are under your care. When you talk about leadership development, most people think it is about improving your ability to lead those people under your care. Leadership is much more than leading those under your care. Leadership is also about leading and influencing those over you - the board or elders. Furthermore, you need to lead your colleagues, usually in peer-group settings. Leadership is 360, you lead up, down and laterally. However, effective leaders not only lead up, down and laterally, they also learn to lead themselves. In many ways, this area of leadership (self-leadership) is one of the most overlooked areas of leadership development. 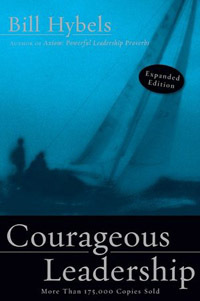 In Courageous Leadership, Bill Hybels writes a chapter on The Art of Self-Leadership. It is one of the best articles I have read relating to this area of leadership development. I will summarize the points that Bill makes in this chapter. [Quote] "The best gift you can give the people you lead...is a healthy, energized, fully surrendered and focused self. And no one can make that happen in your life except you. It's up to you to make the right choices so you can be at your best." To lead well, you need to ask yourself several self-leadership questions on a regular basis. 1. Is Your Calling Sure? Whether you are a leader or lay-leader, it is important to be sure of your calling. If you are sure about your calling, then your leadership will be focused and you will increase in energy and confidence. 2. Is Your Vision Clear? A leader without vision has nowhere to go and nothing to aim for. Every leader needs a VISION. Every leader needs a target to aim for in order to fulfill his call to ministry. 3. Is Your Passion Hot? Passion is your responsibility. You are the only who can keep your passion hot. Do whatever you must do, read whatever you must read, go where ever you must go, but you must keep your passion hot. You cannot expect the people you lead to be passionate if you are not passionate about what you are doing. 4. Is Your Character Submitted To Christ? Leaders are people of integrity. People will not follow a leader who lacks integrity - at least not for long. If you compromise your character, then you compromise your leadership. 5. Is Your Pride Subdued? Pride is a leader's downfall. James said, "God resists the proud, but give grace to the humble" (James 4:6b). Humility brings God's grace and favor to your leadership. Arrogance and pride will only hurt your leadership potential. 6. Are You Overcoming Fear? Fear often immobilizes and neutralizes leaders. When things are going wrong, leaders are often afraid to make changes. The risk may seem too great and they let fear sabotage their leadership. It is your responsibility to deal with fear so that you don't sabotage your leadership. 7. Are Interior Issues Undermining Your Leadership? Your past experiences will often affect your present decisions. If you have been hurt in the past, it will affect your ministry decisions. It is important that you sort these things out so that they don't affect your leadership. 8. Is Your Pace Sustainable? Burn out is very real for ministry leaders. It is your responsibility to develop a sustainability plan that will enable you to be fresh and passionate about your call to leadership and the mission you are to fulfill. Your life, your mission, your marriage and your family depends on you establishing a sustainable pace for your life. Don't expect someone else to do that for you. 9. Is Your Love For God and People Increasing? Love for God and people are central to your ministry experienced. It is important that you nurture an increasing love for God and people while you are called to ministry. Put time aside to nurture your relationship with God. Take time to build relationship with others so that you can grow in your love for people. If you want more information about the The Art of Self-Leadership, click on the following link - Who Is Your Toughest Leadership Challenge?